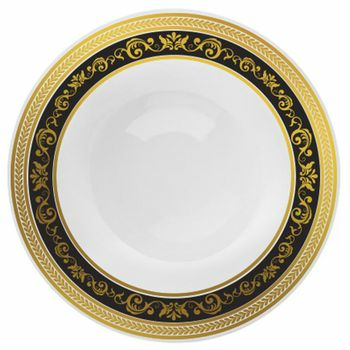 Home»China-like Tableware»Royal Collection - Gold, Silver, & Blue»Royal Collection - White with Black and Gold Royal Border»Royal Collection 12oz. White w/ Black and Gold Royal Border Plastic Soup Bowls 10ct. Royal Collection Clear Plastic Wine Goblet with Black and Gold Royal Border, 10 ct.